This weekend I packed up my “current projects” sewing basket, a box full of linen, and some handbags of sewing notions and hauled them out for sorting, labeling, and prioritizing. My sewing corner is now dusted and ready for work with stacks of projects waiting for me. Prioritizing had the most effect on me: What I wanted to work on was not necessarily what I needed to work on first. The oldest “need now” projects were actually my finger cymbals (called “zills”). I would never have guessed that, but in honest reflection, they’d been on hold the longest. The zills you see in the center of the photo are the oldest set in my kit. I’ve been using these since my college days, some well loved Turkish Saroyan cymbals.They’ve been good to me, but the elastic was at least two years old and getting worn. 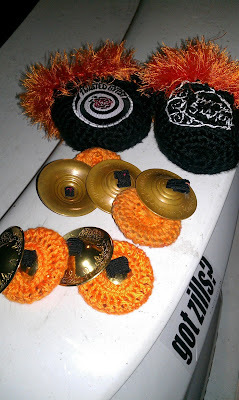 The orange crocheted mufflers, “zuffs,” were also getting a little bit worn. So I replaced the elastic and reinforced the zuffs. I also stitched some contrasting thread on the elastics to identify Right versus Left, Thumb versus Finger. You can just barely see some orange stitching on the Right zills and burgundy stitching on the Left zills. The finger zills have a spot of color on the top of the elastic, and the thumbs have a “T” stitched on the underside center. The new SHINY set in the foreground of my Turquoise International, size B Turkish, 2 1/2″ cymbals. New, new, new! *grin* These needed their first set of elastics so I marked them the same way I marked my old Turkish zills, and I reinforced the zuffs before even using them. Finally, I had a Twisted Gypsy patch for ages and no idea what I wanted to sew it on. So I decided to add the patch to one of my zill bags. The other zill bag features a rough embroidered attempt at the Gypsy Sisters logo, since we don’t have patches yet. Now I have a new heavy set for my performances and my old set to loan to my fellow dancers in classes when they forget theirs or maybe they don’t have zuffs. Later, I need to add the elastics to my smaller Turquoise cymbals (they might be size A), which I’ll sew for tiny fingers. I have much larger fingers than some of my fellow dancers, so I cannot loan them my normal cymbals in class. I have a smaller set just for loaning to someone with tiny fingers. But that set of cymbals did not make the priority list… I’ll work on those later. And just for fun, here’s a great image of Sydney and I (as Gypsy Sisters) dancing at the Secret Garden (Moorpark) at the Into It Tribal Nights August 30 showcase. P.S. You can buy your own got zills? bumper sticker from Faizeh on Cafepress. This summer (strike that) year has been filled with dance, dance, and more dance, with bits of work and computers and crafts thrown into the cracks between all those blocks of dance. Several times, I found the photos from these events brought me some smiles and laughs. In June, the student troupe (with a couple of members from the professional troupe) performed at a Food Trucks event in North Hollywood. 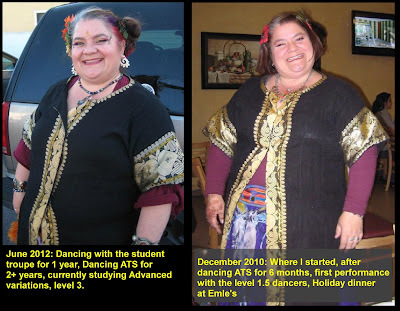 One comparison photo: Me as an advanced dancer after 2+ years work versus me as a beginner, the first time I ever danced ATS in public, after 6 months study. *grin* –> that jacket is already pinned even smaller, now in September. In July, the student troupe and the professional troupes both performed at a Farmer’s Market festival in Santa Clarita. Another mark of having improved over the past couple of years. I still laugh every time I see the old photos from Emle’s in Dec 2010. In August, we held a hafla (party) at the end of the student session at Pasadena City College. 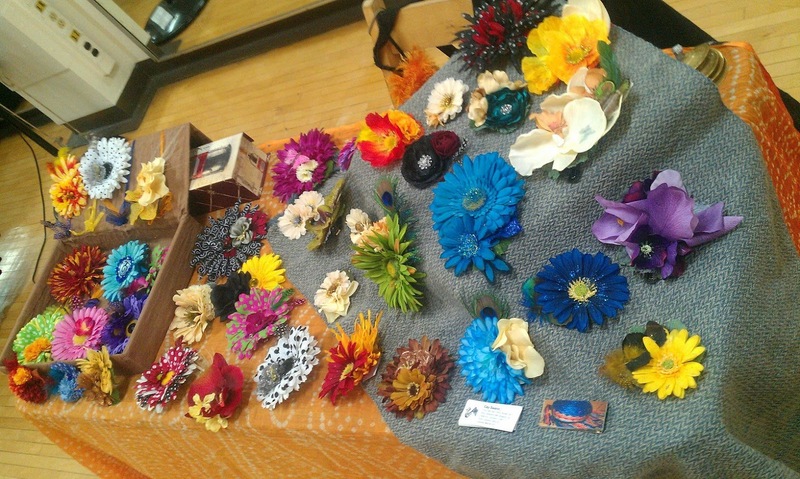 I had a modest store setup for my flowered hair clips. Many of the clips shown here are already sold. I’m working to add photos and listings to my etsy store for the ones that are still available. But one of the most exciting accomplishments for my summer has to be my new logo and business cards. Major thanks go out to Katy, the artist I hired to work on my logo, who created exactly what I was looking for. 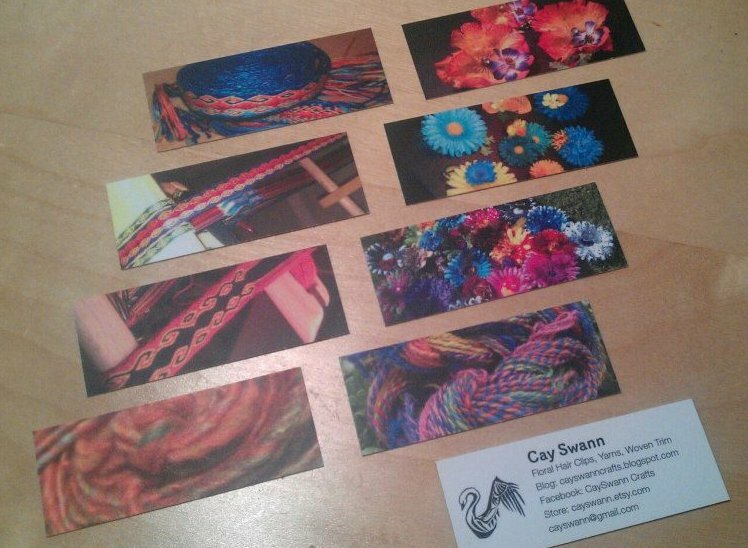 You can see her work on her Facebook page. The Grand Logo of Awesome! 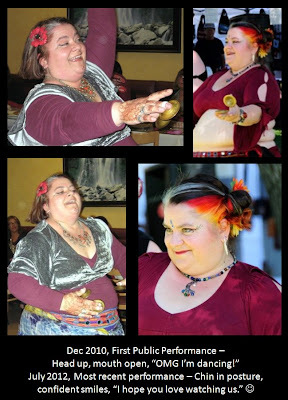 We had so much fun, creating every line, every curve, every feather, every shape in the tribal swan for my business look. It’s everything I could hope to have! 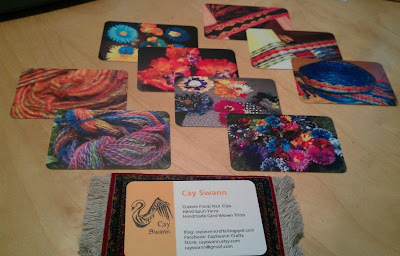 After that, of course I had tons of fun creating business cards (all done at moo.com which I can heartily recommend). Part of the effort to work on my cards stemmed from a motivation to have more product in my store by the end of the year. I’ve decided to focus on promoting three major lines: custom floral hair clips, hand-spun yarns, and hand-made card-woven trim. 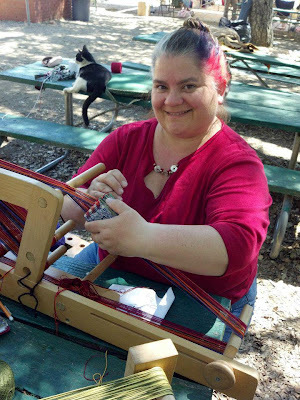 I may branch into tabby warp-faced narrow wares (think “ribbons” made in various yarns and threads, or the phrase “inkle woven” trim*). But since that’s still an untried skill of mine, that’s just a possible plan. This past weekend, I taught a new card-weaving class at the Griffin Dyeworks Fiber Frolic. Although I originally called the class “Rams’ Horn, Eilidh Style,” my friends have suggested it should be renamed “Gypsy Eyeball” based on how often they heard me saying “eyeball” as I was teaching. In fact, several people wandered over just to see what we were weaving, since I continued to describe the “gypsy eyeball” as the mathematical key to understanding the rams’ horn threaded pattern in our card-weaving warps. The Gypsy Eyeball solution to understanding Rams’ Horn was slated to only take an hour, but fortunately none of my students had anywhere to run off to at 11am. 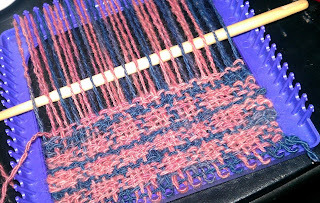 We stayed for the full 2 hours, working hands-on with two different warped examples, learning how to find the key to each warp and how to weave anything without a pattern book. As a two-hour workshop, it worked wonderfully and several people have asked me to teach the class again. I’m quite pleased with the results. I’d like to create a series of youtube video clips that cover the topics in my Gypsy Eyeball class technique. Maybe those will be projects for 2013. 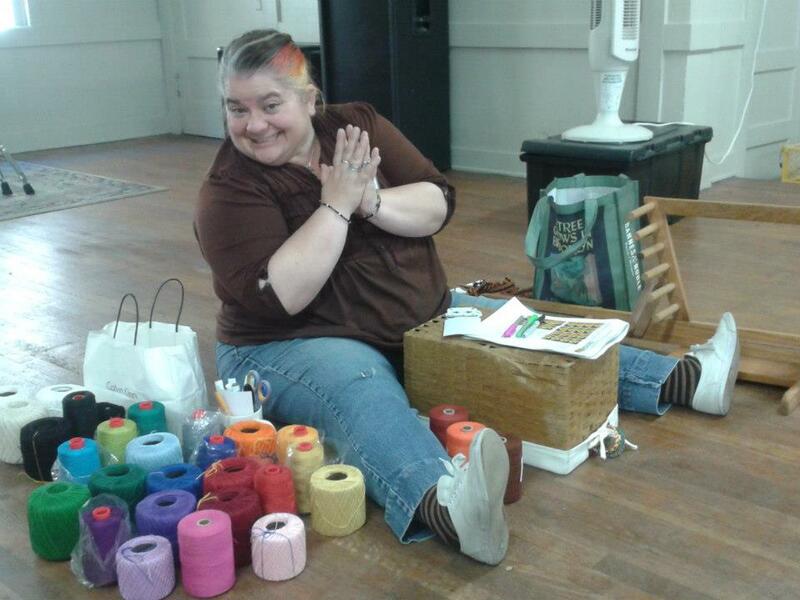 After class, I sat down to take advantage of an afternoon with an empty loom and a basket full of warping threads. Ercil took a fantastic photo of my glee. that you can see between my leg and the basket. I haven’t forgotten my spinning and I have some additional weaving plans mulling in my head, too. but I think I’ll felt the finished swatch and create an embroidered, felted pouch for my etsy store. In addition to all this, I changed jobs in June and now work less than two dozen miles from home. The reduced commute time significantly helps with my increased dance and crafting schedule (as well as time to spend with family, friends, and my Sweetie). I still sit in some horrible LA commuter traffic, but not nearly as much as the four-hour commute of my last job. The team I work with is also AMAZING, and I’m doing technical writing in yet another software developer niche that I haven’t worked in before. I miss the time I spent at JPL (and was *SO* proud of the Curiosity Team), but I love my new job a lot. It’s located in a bustling neighborhood with plenty of stores and restaurants in walking distance. I have so many opportunities to walk and exercise, more than almost any previous job I’ve held. Occasionally, just to relax and start my day off right, I just take out my cardweaving loom and sit for twenty minutes before heading up to the office, weaving quietly at my car. There is nothing quite so calming after a cross-city traffic snarl as twenty minutes weaving (or knitting or spinning or crocheting or whatever is your artistic endeavor of choice). Ahh. Looking forward to what the Fall Season will bring. 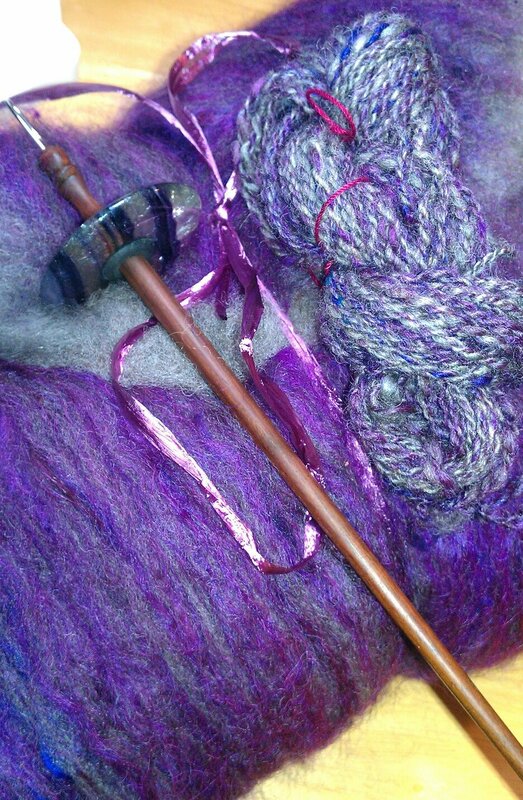 * Postscript footnote – Did you know the word “inkle” just means narrow, woven band? 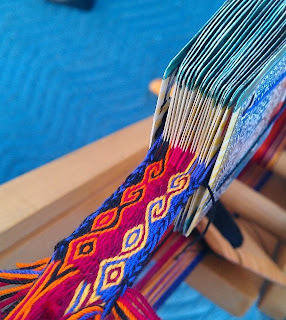 Without getting into the historical controversies of the “inkle loom” or “inkle” bands, I learned some interesting information at dinner the other day, and I’m looking forward to understanding the history better so I can promote credible research rather than muddled jargon. My thanks to Ercil, for getting me thinking along these lines. I have my work sketched out for me.